Both countries are on my list of places I’d like to visit one day. What I’m tired of reading is articles that keep trying to compare their education system to the US’s. I agree that it’s important to look for what’s working in education. Unfortunately, comparisons to student achievement and teacher quality in those countries to the US cannot be done easily. There are many challenges that face US education, both independent and public, but simply comparing them to Finland or Singapore is unfair. Finland, Singapore and the US are very different. In the past few years, Finland has been one of the countries that has consistently placed first on international academic tests. It doesn’t surprise me then that many education reform leaders are trying to look at their practices. In a nytimes article last month, it even mentioned that the president of the National Association of Independent Schools, Pat F. Bassett has made the pilgrimage. The one thing I like about Finland’s education system is that most kids don’t start testing and homework until their teens! Still, Finland or Singapore are small countries that value teaching. It can be harder to get into a school of education than into law or medicine (and the schooling is fully subsidized). they recognize that the quality of teaching matters and they support that from the beginning. Apart from that, looking at what Finland or Singapore is doing right is not going to fix the challenges that exist today in the US. I agree with Linda Darling Hammond, that it might be a good model for a state like Kentucky, but both those countries have a much more homogenous society. The US education system has to stop being reactionary. It cannot repair itself simply by learning from Finland. It has to innovate and lead. Education in this country has always been able to do that, and I am optimistic that it will continue to do so. There are many amazing schools with incredible teachers doing many things right. We should start to look at those as models first. Good teachers eventually find the schools that fuel and support their passion and purpose. It should be the other way around. Schools should be finding those qualified teachers. Just think of all the people who learned Russian or Japanese not too long ago. I think it’s great that they learned a foreign language, but I wonder if those choices were based on what was going on in the world at that time. Finland and Singapore are both on my list of countries I’d like to visit, but somehow I don’t think the general population is going to be learning Finnish anytime soon. Diversity can be a touchy subject. It can make people uncomfortable. Diversity, however cannot be ignored. We need to talk about it. All of these can have multiple meanings, and all are important in beginning an honest, safe talk on diversity. An example that came up was a possible hiring practice in an independent school. If it says on the job description: Masters degree and 5 years of independent school experience recommended, is the school potentially ruling out diverse voices that come from a public or parochial school? For some, diversity brings up the notion of “been there, done that,” but really, diversity is an ongoing endeavor. It promotes social justice, takes away assumptions and prejudices, and teaches us that there is value in what is different. Our school values states that we “actively cultivate and awareness and respect for diversity in all its forms.” Before we can do that with our students, our families, and our greater community, we need to begin with ourselves. Our facilitator began with an excellent TED talk which I’ve included below. It really is worth the 18 minutes. I’ve only been to a couple of really large conferences. At these, it seems that keynotes are usually preceded by a local group of performers. 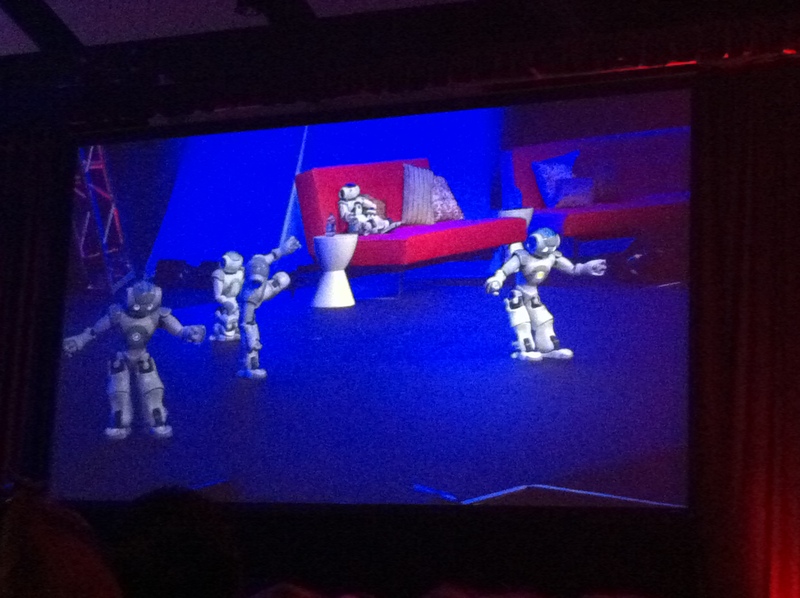 Today’s keynote had a great local dance group, but that group was preceded by dancing robots. They even bowed at the end. Anyway, it was another fun filled day of learning. I’m exhausted and while I know my way around the convention center in Philadelphia now, it’s still overwhelming. Anyway, here are 8 more things I learned today. 7) I met some great teachers (one who is an NAIS teacher of the future), who are planning on putting on an EdCamp in May in Seattle. I’m diving head first into volunteering to organize. I actually only learned what an EdCamp is today for the first time and look forward to being part of the team. The video below explains it. A very cool way for teachers to share. 6) I learned of a math fact fluency program that is adaptive and individualized, can be used anywhere (classroom, lab, home), is easy for teachers to monitor progress and will save countless hours of photocopying fact sheets, correcting, and keeping track of something that should be an automated mindless task these days freeing up the teacher to analyze where the gaps are in the students’ memory of math facts. Reflex is the name of that program. 5) I learned about a free QR code generator at qrcode.kaywa.com. QR codes are those square barcode like symbols seen on this sidebar, that can be read with your camera on your mobile device. That one just takes you to this blog. There are some very cool applications for this. 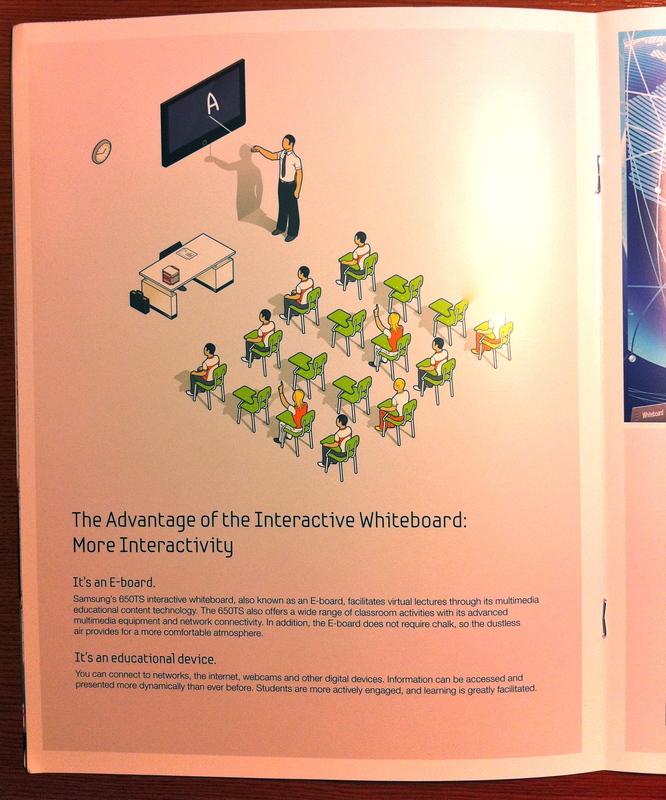 4) Hitachi has a product to help simulate an interactive white board on your pre-exsisting one. Unlike ebeam, however, you don’t need a stylus (just your finger will do), you can have three kids up there simultaneously, and the multi-fingured and whole hand gestures are pretty cool. Priced at $750 it’s a fraction of the cost of SMART boards. I also saw some great portable systems that help lower the interactive whiteboards so kids can use it – both the white board and the projector is mounted onto the cart. The interactive whiteboard wars are starting to shape up and there aren’t just two major players anymore. That’s good for everyone as long as people don’t get to set on each company’s proprietary software. It’s funny how most of the whiteboard demos, elementary, middle, or high, were designed with the teacher standing in front of the class and the class sitting and responding. I get that teachers will use that tool frequently, but I hope students actually get up there and are the ones interacting with the board. Below is a page from Samsung’s brochure. Notice the desks in rows and the students all sitting passively? 3) I learned that I still don’t know how so many companies are selling single use devices for outrageous sums when a $9.99 app on an ipad will do the same thing. 2) I went to an incredible session on how to develop global empathy in children. Some examples: Grandparents in Ireland reading to the class via skype or podcast. Using twitter hashtags, a middle school teacher found a few adult directors who were tweeting about various scenes. The kids who were directing their version of the play tweeted their directions and got feedback from adult directors in England. 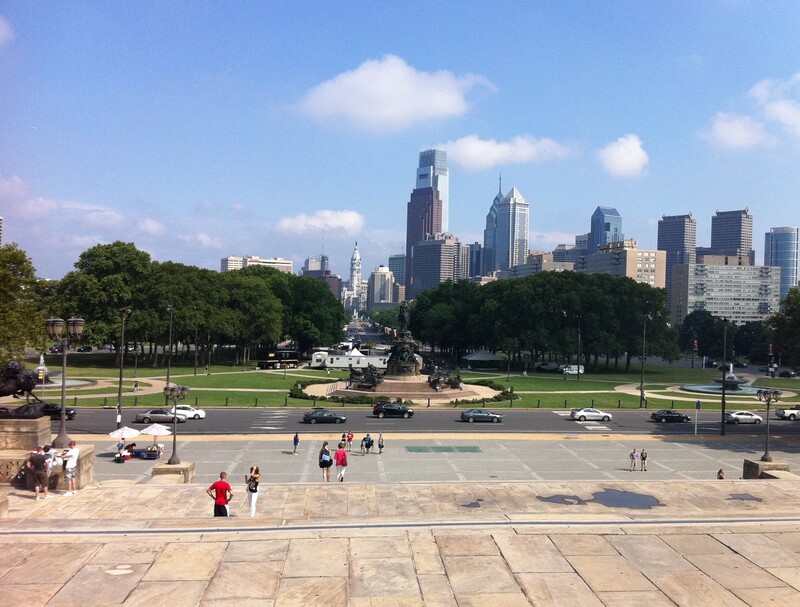 1) The steps Rocky ran up to the Philadelphia Art Museum aren’t that arduous but make for a great scene in a movie. By the way, why is it that almost all attractions shut down the same time each day the conference is over? This past weekend, I saw the Intiman Theatre’s production of Arthur Miller’s All My Sons here in Seattle. The director set the play in Seattle in the Central District with the Keller family portrayed as an African American family living in the 40s with both white and black neighbors. Opportunities for people of color in the 40s were pretty bleak. They were denied entry into many jobs, establishments, and neighborhoods among other things. With this as the backdrop for the play, one could easily see why it was so important for the main character, Joe Keller, to continue to live the American Dream regardless of the cost (it’s an Arthur Miller play – you can guess the cost was pretty hefty). It’s a great production, and if you get a chance to see it during its run, you ought to. Seeing this play made me think of other shows such as Porgy and Bess or Show Boat, and how color-blind casting wouldn’t work for those two shows, but has for something like Les Miserables. In the first two shows mentioned, race is a central issue in the play. In Les Mis, it’s not. When it comes to diversity, race is definitely an important issue, but it’s not the only one. Gender, age, sexual orientation, political views, religious views (or the absence of them), socio-economic status, culture, sub-culture, interests, IQ, EQ, and a myriad of other things all play into diversity as well. It’s amazing to hear some Republicans and Democrats try to debate. They stick to their talking points, don’t answer the questions, and fail to realize that they actually have a lot more in common with each other. It’s this common ground where these two opposing voices should start. It’s through their differences that new ideas and innovations can occur. It’s this common ground that we all share that we need to focus on as well as our differences. The common ground gets us to start something. The differences inspire creativity. That’s why diversity is important. When many people start to talk about diversity, unfortunately, the other forms I’ve mentioned seem to get drowned out, and the focus very often goes back to race. It’s true that students do benefit from seeing teachers that look similar to them, but it is just as important for them to see teachers who are older, younger, female, male, white, black, Hispanic, Asian, mixed, as well as teachers with disabilities, exceptionalities, differing political views, differing orientations, who speak different languages, and so on. In Seattle, we have a large population of students who have one parent who is white and the other parent who is a person of color. Why ask that child to choose a box, or have us fill in a box on their behalf on some diversity survey? Why not figure out who that child is, what motivates her at school, and meet her needs based on those criteria instead. I am of mixed heritage and consider myself very much a person of color. For me, what’s far more interesting than the color of my skin are the 11 years I lived in Asia, the 20 years I lived in Canada, and the 10 (updated 12) years I’ve lived in the US. What makes your students interesting? How can they add to the fabric and culture of your classroom or school? Rather than viewing diversity as ‘what’s the other person’s story?’, it would help to see it as ‘how can we both contribute in meaningful ways to the story?’ Timeless stories like Arthur Miller’s All My Sons work regardless of race. Miller manages to hone in on the conflicts all of us face. I finally had some time to play with Google’s new “Art Project” site where you can virtually tour 17 art museum around the world. I’ve been very fortunate to have been to 10 of those, and it’s never the same as standing in front of an actual piece and viewing it in person. I’d rather my students actually go and see a piece of art in a local museum or gallery in person. Field trips are an essential part of learning, and while many schools are cutting back due to the recession, many can be had for free. Nonetheless, I have to say that it’s an amazing website and the virtual tours seem like their ‘street view’ in Google maps. Most of the top artworks are available, and if you have a google account, you can start your own collection and save them in the cloud. Unfortunately, there are a few disappointments. One of the biggest impacts I had viewing art was in Madrid, at the Museo Reina Sofia. It was Picasso’s painting, Guernica. That painting is not available for viewing. Each museum only has a few wings you can tour through. Nonetheless, it’s a great tool for having children respond to art when you can’t get to the Moma in New York, for example. Once you get deep into using the navigation and information tools in the side bar, it’s easy to get caught up in it. There are audio and video guides and notes, but best of all for many of the featured works: you can zoom in possibly closer than you could in the museum without setting off any alarms. Some of the high-res pictures are great for looking at detailed brush strokes. This article from the Boston Globe today about schools cutting back on field trips is quite sad. If the objectives of the field trip are clear, a lot of learning takes place outside the classroom. The folks at Google are planning to add more museums and wings. And, should the Seattle Art Museum be added, it would be great to have a virtual preview of a place and then have them see it for real in person. This youtube video below is a good way to get an idea and get started. How else could this be used in education? I look forward to hearing your ideas. I can tell you that this year, the simple ability to project and use Google Earth has made the concepts of continent, ocean, country, and even smaller divisions, much easier for all second graders to grasp, not to mention geographic vocabulary. President Hu of China’s recent visit to the White House, reminded me of an article in the WSJ about Chinese moms that appeared a few weeks ago. Not that I really needed a reminder. This article has sparked debate everywhere. It continues to be forwarded, and discussed across the web. Published on Jan. 8, it is still the number one read and emailed piece in the WSJ. That article, by Amy Chua comes from her new book called Battle Hymn of the Tiger Mother (it’s already on several bestsellers lists). Even this coming weekend’s NYTimes Magazine has an story that continues to weigh in on this particular parenting style. I think the idea that the Chinese have it right in terms of parenting and education, is one that is fueled by the media and full of misconceptions and stereotypes. Even Chau herself says, “The Journal basically strung together the most controversial sections of the book. And I had no idea they’d put that kind of a title on it. But the worst thing was, they didn’t even hint that the book is about a journey, and that the person at beginning of the book is different from the person at the end — that I get my comeuppance and retreat from this very strict Chinese parenting model.” I have not read her book, but I have read the WSJ piece. There are indeed so many stories in the media trying to pit eastern and western philosophies against each other. Some are about China’s rising economic growth, some about math test scores, parenting, and language. Within the article online, the WSJ has a binary opinion poll: “Which style of parenting is best for children? ‘Permissive Western parenting’ [or] ‘Demanding Eastern parenting,'” implying that there are only those two extremes. If the words ‘permissive’ and ‘demanding’ don’t seem carefully chosen to polarize people, the title of the article, “Why Chinese Mothers are Superior” should. According to this CNN article, many schools in the US are being funded by the Chinese government to teach Chinese as the second language. While I believe learning a second (and even third language) is important, especially when kids are young and wired for language acquisition, what that second language is should be meaningful and useful. For some it may be that one of their parents speaks French and the other speaks English. For others, it may be purely about learning something new and different. Many in this country would argue that Spanish would be a more meaningful language to learn than say Japanese (not that there’s anything wrong about learning Japanese). Predicting what will be the most useful second language for your child when he/she grows up seems a little short sighted. Suppose they end up falling in love with a Finn and moving to Finland (neither of the second languages I mentioned would be terribly useful there). Is the world changing? Yes. Do I think everyone is going to speak Chinese? No. But I may be wrong. I just don’t predict it happening in my generation. For one, learning to read and write Chinese is extremely difficult. Unfortunately, I have read about the demise of languages in smaller communities. Many people learned Russian during the cold war, I wonder how many use it today. Teaching kids to read English, especially kids who struggle with reading, involves getting them to make the connection between the letters and the sounds they make. There is some rote learning involved too. For some kids it may be the common sight words or homophones. With Chinese, it differs considerably. It’s not a phonological writing system. Chinese is a language based on individual or compound characters. You can’t “sound out a word” in Chinese. There have been phonetic schemes based on the alphabet for Chinese, but that was developed for foreigners. This op-ed piece in the NYTimes this weekend was written by a correspondent who worked in China, and whose children went to school there. While he agrees that kids were way ahead of his kids in math, there was something missing about an important way it differed from western education: western education fosters and promotes creativity and innovation. The Winter edition of Independent School Magazine‘s focus is on the ‘model minority’. An article from this issue, titled “The Model Minority Myth” reminds us of the dangers of stereotypes. I agree that you can’t let children have free reign, and you have to keep your expectations high. But we also have to learn about each child as an individual and know that those high expectations are going to be different for every child. According to the recent literature out there (Drive, Mindsets, Brain Rules, Nurtureshock), Western research shows that praising your child specifically for effort is what counts, not just praise for the sake of praise. For me, this was a good reminder of how easily one can fall into the trap of stereotypes and a reminder that teachers must check any pre-conceived notions at the door. In the meantime, here is a TED talk by Amy Tan, author of The Joy Luck Club (in a way, a book about Chinese mothers) speaking about her own creative process. While completely different, you might see from this video why certain stereotypes persist. It’s surprising and disappointing how so many schools choose the arts as one of the first department to go either when times are tough or when they are pressured to increase their scores on achievement tests. It doesn’t take one long to find that these cuts are taking place all over the country: Fort Lauderdale, California (and that was in 2006 when things weren’t as grim) (here’s a more recent story from CA), and even as recently as this past week over in the UK. At least according to the Obama’s art-education platform, it states that …”we should encourage the ability to think creatively that comes from a meaningful arts education.” This article about the exhibit from the Seattle Times talks about the links art has to “math, science, literature, you name it.” I feel extremely fortunate where I work. When they designed the new school building, they had several local artists contribute to a few pieces around our campus. Yesterday my students and I had a great day of art. One of Seattle’s local artists, Juan Alonso who created 5 pieces of abstract art around our campus came to talk to the students about what inspired him and about some of the process involved. He also started giving workshops to classes on abstract portraits. I can’t wait until it’s our class’ turn. What I love about abstract art especially is that it is open to interpretation unless the artist actually tells you what inspired him. The sculpture on the right sits in front of our school. I always pictured it as the font of knowledge or something to do with passion. Juan Alonso explained that when he thought of an elementary school, he thought of a child with arms reaching upward. Now every time I see it, I can’t help but think of that. After our assembly, four classes headed to the Picasso exhibit at the Seattle Art Museum. It’s the last week of the exhibit, and I have never seen the place that packed. Rather than battle the crowds and try to see all of it, our wonderful docent selected just a few. She had the kids full attention and began by asking them what they thought they saw. With this kind of open ended question, it was amazing how much effort the children spent looking at the painting, the colors, shapes, etc. and the thoughtful, yet out-of-the-box responses were inspiring. Asking children to inquire about art is no different than what we ask them to do in science. Much of the vocabulary needed to describe Picasso’s work is shared with geometry. Reading about his life and the times, learning about Spain and France, and writing about their experience are natural connections. Our docent was wonderful and asking the right kind of questions forcing the kids to think a little more critically rather than just come up with a one-right-answer response. Of course, what I loved is that his art is celebrated for breaking the rules, for being a visionary and wanting to push boundaries in art, for leading change rather than following it, and working hard. Some of his paintings were based on hundreds of initial sketches. This exhibit also highlights someone who worked until he was 91. Noticing a couple of my children’s eyes light up when the docent pronounced that Picasso created his art as one would write a diary. You know the kids who want to draw before writing and those who prefer it the other way around. Why not celebrate both kinds of kids and be open to different ways of arriving at the same objective. The children then took part in a workshop at the museum offered by a teaching artist where they created mixed media collages of portraits using the concept of viewing things from multiple perspectives. The results, though unfinished, were wonderful, unique, and more importantly something they were all proud of. Whether it be the performing or visual arts, schools must make room for it. Visual art promotes multicultural education, critical thinking skills, inquiry, creativity and innovation, math skills, science, literature, and so on. The exhibit runs for just a few more days until the 17th of January and the museum has extended its opening times until midnight. This was one of those things that wasn’t part of the planned curriculum, but in my opinion, worth doing. It was my third time seeing this exhibit, and I was still awed. I hope some of the children were too. If you don’t mind crowds, you can click on the picture below which will link you to the museum’s website. What Makes a School Great? How Can Kids Take Risks in a “Safe” Environment? The views of this blog are that of my own and not of my employers.